One day after endorsing Donald Trump, U.S. Sen. Ted Cruz refused Saturday to say whether he thinks the Republican nominee for president is fit to lead the country. One day after endorsing Donald Trump for president, Texas U.S. Sen. Ted Cruz refused Saturday to say whether he thinks the Republican nominee is fit to lead the country. In an interview with the Texas Tribune’s Evan Smith, Cruz said he endorsed Trump because the November election is a binary choice between Hillary Clinton and Trump. The junior senator from Texas and unsuccessful presidential candidate said he is voting Trump because he worries Clinton would appoint liberal justices to the U.S. Supreme Court and do damage to the country. But that was as far as he was willing to go. With each of his carefully worded answers, Cruz made clear that he worries about what a Trump presidency would mean. And he still struggles with some of the things Trump did during the campaign, such as mock Cruz’s wife’s looks and suggest without any evidence that Cruz’s father was involved in the Kennedy assassination. But, in Cruz’s framing, one thing would be worse than a Trump presidency: A Clinton presidency. Did he mean those things? 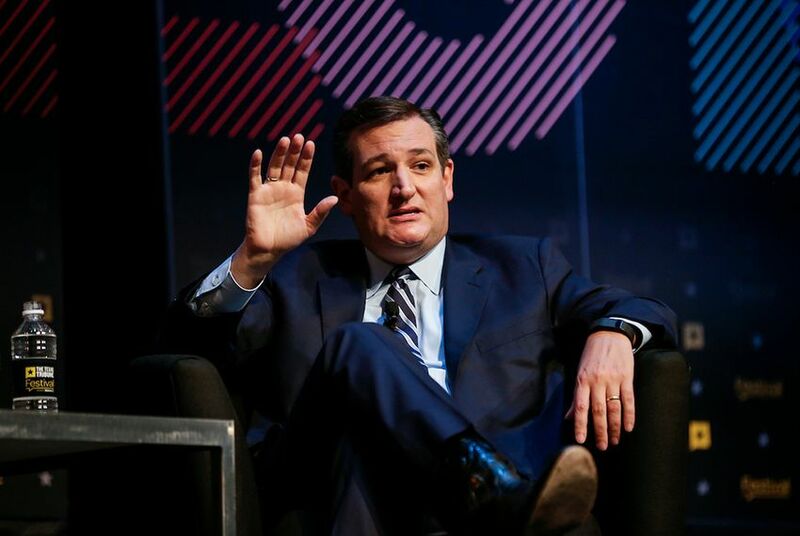 Cruz was speaking at the Texas Tribune Festival in Austin before a crowd of hundreds. He received a mixed reaction from the bipartisan crowd. Many cheered him, but he also received jeers. Cruz had held off on endorsing Trump for months after dropping out of the Republican primary for president. Most notably, he was booed loudly at the Republican National Convention for saying voters should “vote your conscience” in lieu of explicitly throwing his support behind the nominee. Cruz’s rivalry with Trump became personal when Trump speculated that Cruz’s Cuban father was involved in the Kennedy assassination and retweeted an unflattering picture of Cruz’s wife. Cruz said he talked to Trump Friday, and that Trump has not apologized for the attacks. But Cruz said he, his father and his wife made the collective decision to forgive him. Issues like Supreme Court nominees are more important, he said. At the end of the interview, Cruz took two questions from the audience, both from attendees clearly angry over his choice. But Cruz was tempered in his defense of his decision to endorse. The first questioner, a Muslim woman, asked how she could feel safe with a president who she believes is a racist. Cruz answered, “That is a question you are going to have to ask yourself.” He then went on to warn about the danger of “radical Islamic terrorism” and said he worries that Hillary Clinton won’t defeat it. “That is a question I have wrestled with,” Cruz replied. The answer, he said, is that Clinton would appoint as many as four liberals to the Supreme Court. “If Hillary Clinton is elected president, the court will be lost for a generation and that means my daughter’s rights will be lost for a generation,” he said. And while most of the questions were about the presidential race, Cruz was also asked about his political future. Trump has expressed support for the idea that another Republican should challenge Cruz in his 2018 Senate re-election bid. The most common candidate mentioned is U.S. Rep. Michael McCaul, an outspoken supporter of Trump’s from Texas. “I don’t think Texans want a senator who will just go to Washington to roll over and go along to get along,” Cruz said. “That is a judgment that the voters are going to have to make,” he said.